A GoPro is a pretty expensive item and whilst they are designed for high octane action there is no getting past the idea that there is always a knock that would kill the camera regardless of the housing, skin or durability of the build. A GoPro is for a serious enthusiast, but what if you are looking to dip your toe in the water of extreme sports and don’t know if you would use a camera very much, or don’t want to risk destroying a £400 GoPro? The Kitvision Rush feels good right out the box. It’s well weighted, features a brushed steel finish and looks the business when attached to a helmet, handlebar or just in hand. There are a large amount of features that one cannot ignore and the potential for use it immense. I was full of great ideas looking through the different mounts. From here on everything was going to become a headache. You really appreciate a screen when you don’t have one. All the vibrations and light flashes in the world can happen however that doesn’t necessarily mean things will go the way you want them too. Especially if the bundled software is trash. 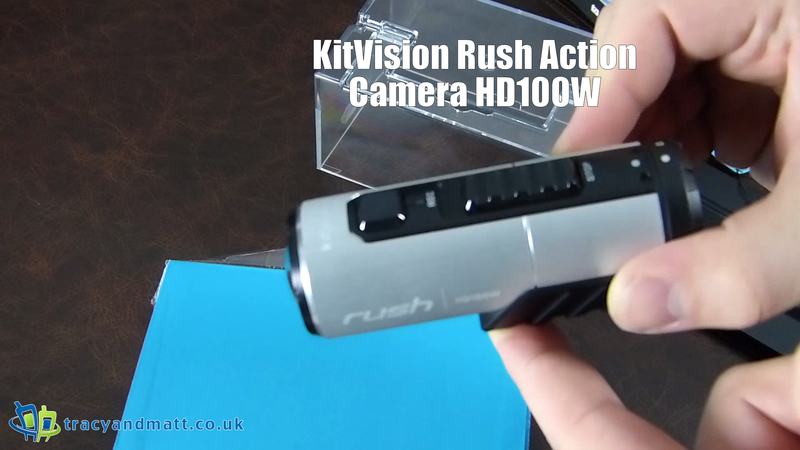 As you can see from the unboxing video the Kitvision Rush gives pretty good results when in use. The picture is clear and crisp, the audio, whilst hardly cinema quality, doesn’t offend and the camera itself impresses for the money. When it works. The footage captures was a third attempt. The first, at the gun range, didn’t work well. Partly my fault, the camera arrived in the morning, I grabbed it on the way out the door on the way to the range after a quick unboxing expecting to be able to shoot right away. Instead I got home to a blank memory card after a confusing collection of buzzes and light flashes. The manual was required. Not a particularly bad thing however I was a bit annoyed reading the manual to find a how to, instead of looking for extra features. I downloaded the suggested apps and got things working. A couple of days later I figured I would attached the camera to the car for some exciting close to the road footage from various vantage points. However, this led to 30 mins of getting in and out of the car adjusting, pressing buttons, lost connections and laggy apps. On the odd occasion I managed to view the camera footage however I never managed to capture any footage. A week later I begrudgingly picked up the camera to attach to the bike, I spent 5 minutes with manual, phone and camera and got it to work sporadically. I put the phone away and relied on what I had learned from the buttons and just recorded a bunch of footage to took a load of photos. No streaming, no clicking around the features, no ad-hoc wifi. A painless as possible left me really happy. Most of the footage did not make the clip as it is more personal however what is there is great for a £130 camera to throw around. I have only charged it once and haven’t run out of battery yet. Documentation shows 2.5 hours however I must be approaching that soon. However, you have to take another cable with you if you are planning a trip, you cannot share with your micro USB you might have for a phone or tablet. Most of the problems with the Kitvision Rush can be fixed fairly easily and I would not dissuade anyone from purchasing one for this. If seeing what you are recording is important you might need to look elsewhere unless you have incredible patience. At £130 I would be pleased with the quality of the camera itself.